Help this garden snail catch up with her friends who are in the garden. Rahul has been separated from his mother in the mall. She is on the ground floor while he is on the top floor. Help Rahul find his way down using the escalators that are marked going down or the flight of stairs. Help the rescue ship find its way to the island. Tiger Cat has lost his way. 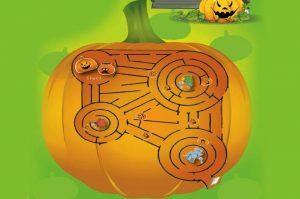 Help him to get out the maze to reach home safely. Mr. Pot is stuck in Scary Pumpkin's corner who will break him into pieces. The numbers are having a New Year party! 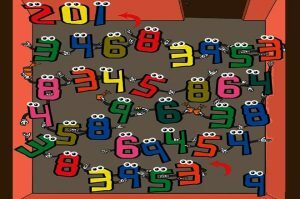 Help the number 9 get to his friends 2,0, and 1, across the room by finding his way through the number chain.